Aviation Safety and Management Consultants', "Quest for Positive Detection of Fuel Contamination." 6,418 NTSB Undetermined Engine Failures! The answer may be on this timeline. Positive detection of water contaminated fuel is the subject of the SumpThis web-site. To understand why positive detection is so important, it is necessary to understand that water can be introduced into an aircraft's fuel tank in several ways, and while preventive measures are usually taken to prevent water from entering a fuel tank, a reliable means of positive detection of prevention must exist. For years, in general aviation, sump drains, moving aircraft wings, dipping an aircraft's tail and taking fuel samples during preflight inspections have been the means for positive detection, but as material on the SumpThis web-site indicates, these means are unreliable and affect safety of flight. There are four primary sources for water contaminated fuel. One source is a fuel tank's filler neck where fuel is added to a tank. Water from rain and from washing an aircraft can enter a tank through its filler neck if it's not properly sealed with a fuel cap. 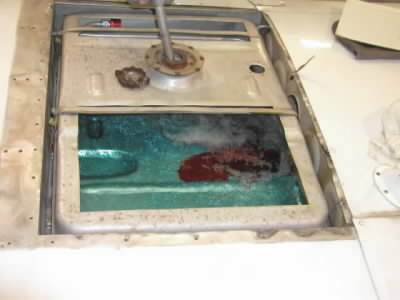 Images of fuel tanks show a red dye added to water to contrast it with blue tinted fuel. 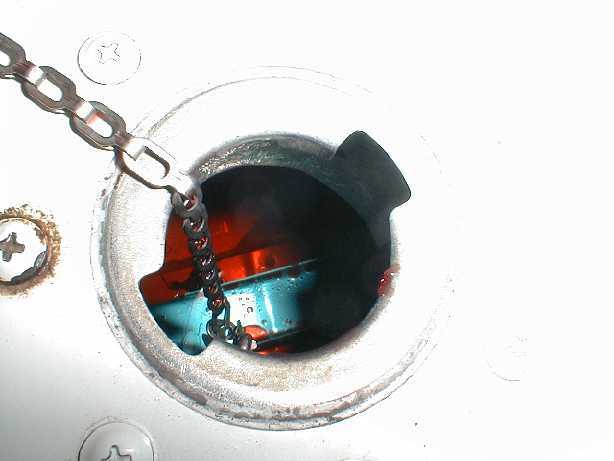 Fuel can also be contaminated from condensation that occurs within a fuel tank. Over a period of time, condensation could introduce a hazardous quanity of water. Additionally, water contamination can occur from a contaminated fuel source during a refueling process. Fuel trucks and fuel storage tanks are susceptible to water contamination. Finally, sabotage in the absence of proper security is another means by which water contamination can be introduced into an aircraft's fuel system. 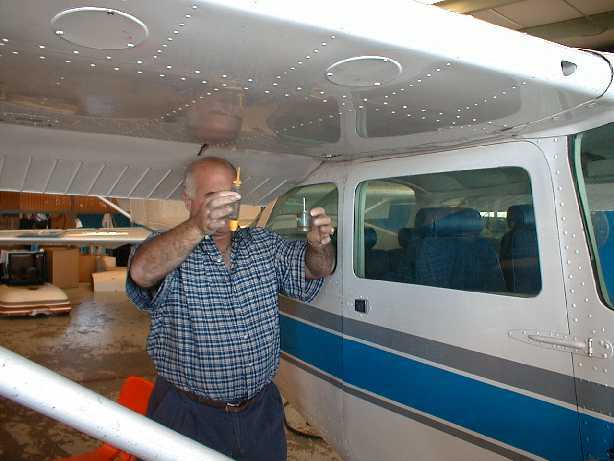 Pilot's take a fuel sample to check for fuel contamination during a preflight inspection using aircraft manufacturer prescribed procedures that are certified by the Federal Aviation Administration, FAA. If a fuel sample reveals water, positive detection of it has occurred. But what if a fuel sample does not reveal water contamination? One might think that using FAA certified preflight procedures that the answer to the question is positive detection of no contamination, but documented research contained here on the SumpThis web-site (see FAA March 10, 2000 safety letter) indicates that this answer is incorrect because it appears to be possible for water contamination to exist and not be revealed in a fuel sample. Yet, thousands of general aviation flights are made based on fuel samples that do not reveal contamination, and many aircraft accidents in general aviation are unexplained. Water contaminated fuel affects safety of flight because it could cause an engine to run rough or cause an engine failure. In either case, these circumstances could further lead to a forced landing or a crash. It is because of these dangers to pilots and people over whom they fly that SumpThis presents research on the topic of positive detection with emphasis upon the case of a clean fuel sample. The dangers can be life threatening. The research presented spans about thirty years. It includes research by individuals, government and universities that is organized along a timeline from which a variety of documentation ranging from fuel tank experiments to correspondence can be found. If you are involved in general aviation, or if you are a person over whom aircraft fly, please proceed to the timeline.